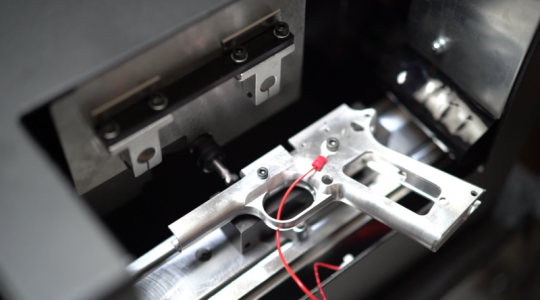 Refinements in hardware and software allow the tiny CNC mill to create pistols. Three years ago, Cody Wilson and his organization, Defense Distributed, released a $1,200 computer-numerically-controlled (CNC) mill called the Ghost Gunner. The machine essentially made home gunsmithing faster, cheaper, and more portable than ever before, but it had a limited scope (no pun intended). Initially, the Ghost Gunner only aimed (OK, maybe some pun intended) to complete unfinished lower receivers for AR-15 semi-automatic rifles. Today, that scope widens: Wilson and Defense Distributed are now in the handgun business, too. Defense Distributed will offer two of the most common handgun “80 percent” receivers—for Glocks and single-stack M1911s—for interested customers to complete using the Ghost Gunner. “What we’ve done for ARs we’re going to do for handguns now,” Wilson tells Ars. Defense Distributed’s store now carries new fixtures, frames, and tooling to create these two handguns, in addition to its previously offered AR-15 lower receivers and jig sets. “Just like the ARs and stuff, you’re making the identical item that you would otherwise handle, purchase, and fire—so it feels identical,” Wilson notes. “These are real guns.” If the ability to sit at home and make a genuine handgun (which this very much is) seems crazy, perhaps you’re not familiar with the work of Defense Distributed. Nearly two years before Wilson and co. released their AR products, he famously demonstrated the ability to 3D print a lower for an AR-15. Wilson has been a 3D-printed firearm pioneer for five-plus years now. As you might expect, the initiative has generated some pushback. People ranging from Google CEO Eric Schmidt to various politicians have publicly voiced displeasure (or attempted to introduce legislation) regarding the idea of 3D-printed firearms. FedEx initially refused to ship Defense Distributed products. The thought of an untraceable, DIY handgun in the era of so many single name tragedies (Aurora, Newtown, Orlando, Charleston, and so on) certainly raises many complex questions. There is no foolproof way to ensure a 3D-printed gun won’t be used to commit a crime in the same way there’s no foolproof plan to ensure the safe use of any firearm. But currently, creating a handgun at home remains entirely legal. Wilson says given how Defense Distributed’s new handgun offerings are essentially just different models of products it previously sold, he doesn’t expect any new legal challenges to arise. So for now, any lingering legal headaches for the company instead remain tied to its ongoing First Amendment lawsuit with the State Department regarding whether CAD files for 3D printing a gun can be distributed online.